Dirty Money is a book exposing how various players of the Wall Street of dubious repute have a significant say in the electoral process of the nation who project themselves as the flag bearers of democracy. The book starts with a dedication to the citizens of the United States and then proceeds to explain how campaigns of politicians are financed, often with money from manipulative players in Wall Street who fund the campaigns breaking all political barriers. 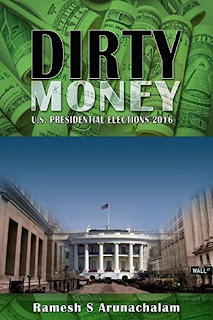 The book has its focus on tax evasion, corporate crime, how they route money to foundations of the candidates and of course, the involvement of Wall Street. I liked the way how the author brought out the flaws of the present system, especially, the use of basket options to claim benefit of a long term capital gain and setting off the same, often creating fictitious capital losses. The former was explained by citing the example of Renaissance Technologies said to have avoided around 6 billion USD in taxes and the latter was explaining the activities of the businessman Haim Saban. The author also has backed up all his figures and details with citations from reliable sources, including from committees set up by the government. The author often quoted Bernie Sanders and stressed on the cause that former candidate was trying to push for; reforms in Wall Street and the desperate need for them. Last, the author also brought out the issue of conflict of interest and how the financial regulatory framework has been systematically made pro Wall Street by repeatedly appointing Wall Street players to the state Treasury. I also appreciate the fact that the author maintained neutrality and throughout the book, did not endorse either candidates even though he did question the conflicting promises of Hillary Clinton on cracking down on tax evaders and at the same time and bringing in tighter regulations to Wall Street and the same time, delivers paid speeches to top executives, the transcripts of which are not released, akin to Donald Trump's tax returns. While I praised the author for not endorsing a candidate, I couldn't help but feel that nearly 90% of the focus was on Hillary Clinton and despite Donald Trump making promises, especially his tax policies which very much raises the question of conflict of interest as it turns out that such policies tend to benefit him personally but then, it was hardly touched upon. Donald Trump's misdeeds, through the Trump foundation, was not part of the book at all but right here I shall end talking about what was not in the book and focus on what was there. I do agree that the author did give citations to most of his text but then, the words often used were 'reported, alleged, named, tax issues' and not convicted and very rarely, were they convicted tax frauds. Moreover, the author spoke about exploitation of loopholes; and legally, exploitation of loopholes is not tax evasion but rather, tax avoidance and the same could be corrected only by an amendment to the law, even though I agree that the author did emphasise on the need for a radical reform through to the laws and regulations governing the industry. Also, in many of his individual examples, the author quoted donations in four figures, which is totally insignificant considering how someone as insignificant as Governor Martin O'Malley could raise close to 6.3 million USD. On a side note, I would also say that this book is not something meant for an average person because it deals with a lot of intricacies such as tax laws, SEC norms, derivative instruments, etc. and fortunately, since I have done a couple of SOX audits, I am broadly familiar with the SEC requirements and thus, could appreciate the book. While Clinton or Trump could become insignificant after November 8th, 2016, the issue raised by the author in this book is a matter for serious consideration and one could hope that the next President of United States, after she gets elected by a huge majority manages to implement these reforms, at least to keep the Bernie Sanders bloc of the Democrats at bay. I really hope Bernie is, and the system is reformed. Coming back, to conclude, I would award the book a six on ten, it gave a pretty good insight as to how Wall Street influences elections but then, I would have liked it if there was reasonable focus on both candidates.